Noise Reducer The experimental noise reducer is a level sensitive frequency filter. The spectrum of the received signal is analysed, and any frequency whose amplitude is below the threshold set, is zeroed - when switched on the NR does generate artifacts but I have found that the brain is good at learning to ignore the "twinkling" and pick out signals. The SDR may be tuned using several mechanisms. Move the mouse pointer over the digit you want to tune, eg if you want to tune in steps of 100Hz then move the mouse pointer over the 100' Hz digit. When you tune a digit, eg 100Hz, all digits to the right of that digit are set to zero. If you want to lock the tuning rate, then RIGHT Click over the digit you want to lock the rate at, OR LEFT click over the tuning rate indicator, ie the one showing x N KHz etc. 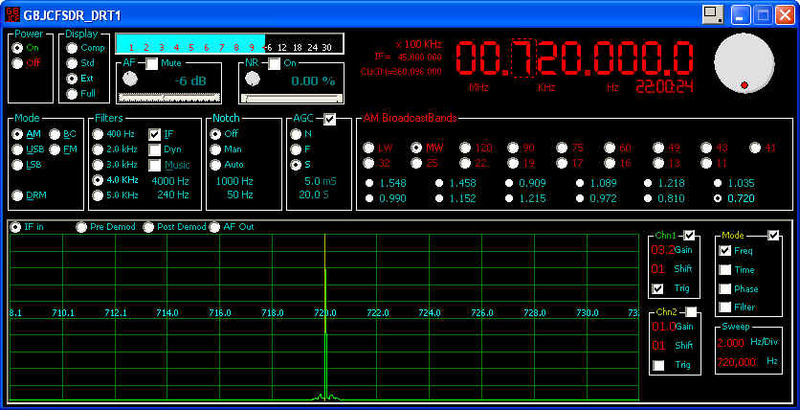 If you click on the words MHz, KHz, or Hz, just under the main frequency display, then the appropriate part of the frequency is set to ZERO, ie click on KHz, and the KiloHertz portion is zeroed. Shaft Encoder - Alps P/N EC16B36104 available from http://rswww.com No. 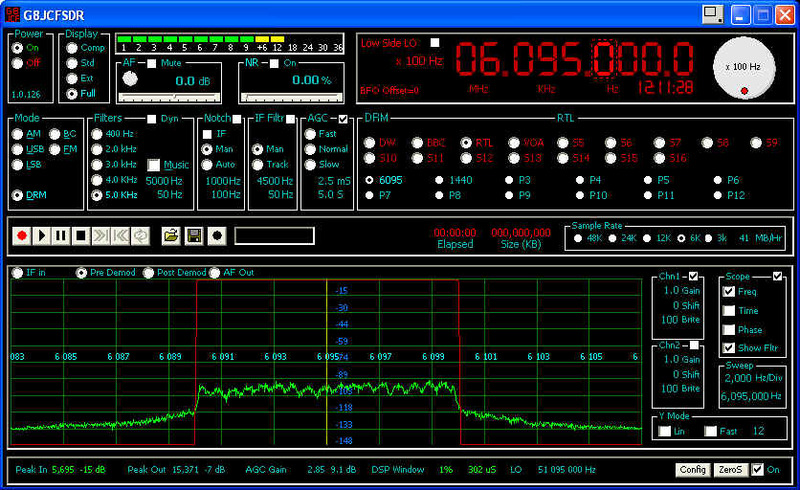 265-1723 about EUR 4-00; see Using a Shaft Encoder to tune the G8JCFSDR. Soft Tuning Knob - hold down the left mouse button over the tuning knob and turn the knob - more of a gimmick than really useful, but for completeness here it is. Presets 1) Presets are SET by holding down the SHIFT key, and simultaneously clicking the RIGHT mouse button for a QUICK preset set. 2) Select a preset by LEFT mouse click. 3) You can edit a Preset by RIGHT clicking over the preset you want to edit. (I will be extending this capability to editing the band selectors soon). The Bandplans/presets are held in *.BPL files in the same directory as the program. If you add another .BPL the SDR will automatically find it the next time it starts up and add it to the list if available Bandplans. Select the filter bandwidth appropriate for the demodulation mode desired. 400Hz is good for CW, 2.0KHz is good for SSB, 3,4,5 kHz are good for AM broadcasts. Click IF On for improved selectivity. Dyn is special kind of filter which automatically tracks the greatest amplitude peak frequency of the received signal, and sets the filter's centre to that peak in real-time. The G8JCFSDR provides fully adjustable filters. The adjustment precision is 10 Hz. To adjust the High frequency cut-off, place the mouse over upper Hz figures; use the mouse scrollwheel to roll the HF cutoff frequency up or down. To adjust the Low frequency cut-off, place the mouse over the lower Hz figures; use the mouse scrollwheel to roll the LF cutoff frequency up or down. To reset the filters to their preprogrammed default pass-bands, Right mouse-click over the cut-off adjust figures. Notch The Notch facility allows you to notch out, over -60dB suppression, an interfering signal. The notch facility is particularly useful when two broadcast stations interfere and produce that annoying heterodyne whistle. The Notch facility is implemented by a band-stop filter. In Automatic notch mode, the G8JCFSDR continuously and automatically adjusts the notch centre frequency in real-time to notch out the strongest frequency. You can adjust the AGC Attack and Decay time constants using the upper and lower figure displays in the AGC box using the mouse scrollwheel. Scope The G8JCFSDR has a built-in Oscilloscope, Spectrum Analyser and Phase Angle display. Probably the most useful is the Spectrum Analyser since it allows you to see the shape of the received signal, and also activity around the received frequency.